Sooooo remember when we first moved in and I was totally in love with the simplicity of the new house? I didn't want to add too many tchotchkes and really enjoyed the quiet in the house after a few months of craziness. I didn't have anything hung just yet and I ended up just adding some books to the top till I figured out exactly how I wanted to decorate them. But the longer we're in the house, the more I want to cozy it up -- I so enjoyed that simplicity for a few months, but now I feel the desire to make it feel more like us. And if you know me...you know my heart belongs to built ins. ;) I've mentioned over the past few months that my mind was changing. And I'm so glad it did! I drew up a very simple design and kept in mind on the one side of the fireplace we'd need to house our electronics and sound system stuff like a subwoofer (it's been sitting out all this time). I started on the easier side for now, and now that I've got it down I'll start the other one. But I had to share it with you! I LOVE building things like this. It's so satisfying and I find it fun. It's like a big puzzle. But I don't use any fancy tools or materials to do it -- so YES, you can do this too! They grab into the wood and screw in SO easily. 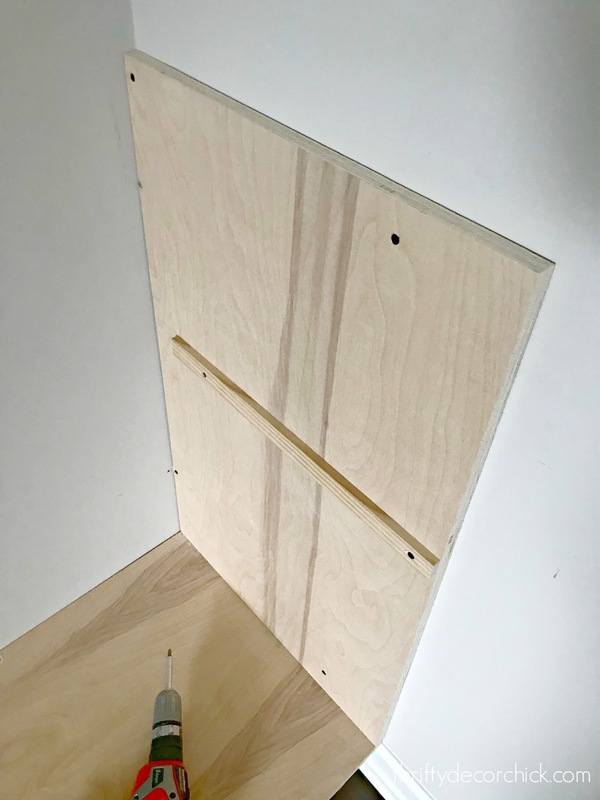 I use the 1 5/8 length for connecting pieces together and a two inch screw for securing the sides and supports into studs. 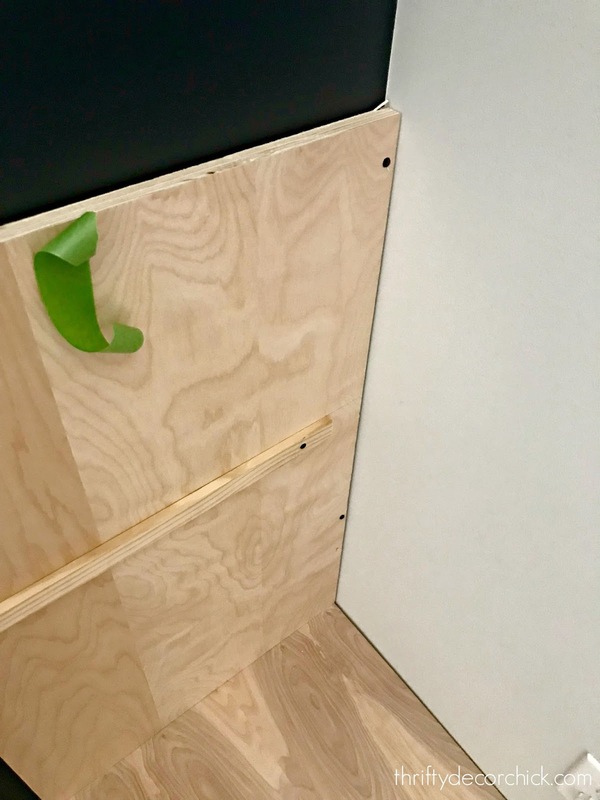 I secured that with screws into the supports on the sides, and then added a 1x2 support across the back underneath the shelf as well. 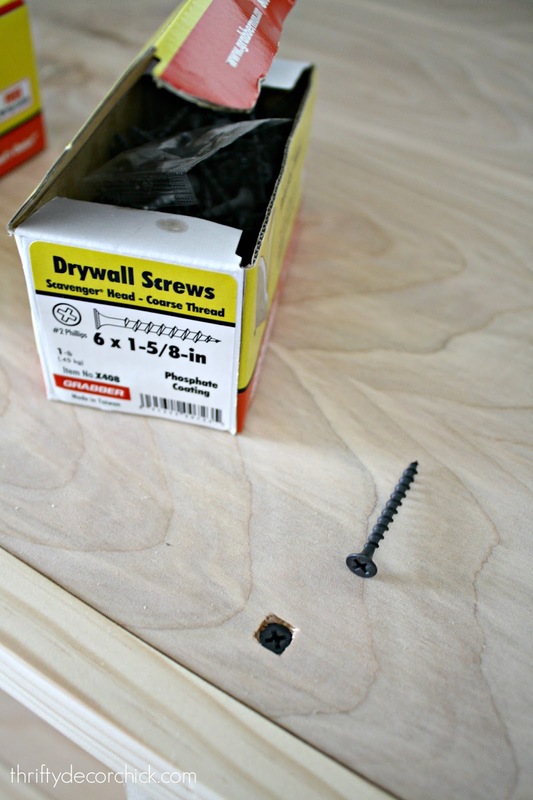 I screwed that into studs along the wall. By the way, there's no need to add a wood back when you have caulk and paint. It will look like one big piece by the time I'm done. I secured each support piece from the top with screws. Additional support is provided with the trim work I added to the front, which I'll show you in minute. You can see I also added supports underneath the whole built in on the floor -- they're just scraps I cut to size and secured with screws. I still have to add quarter round to the base, as well as caulk like crazy. I've said it a million times -- caulk makes almost any project look professional! All the imperfections disappear with that stuff. Don't worry about it looking perfect! The lovely folks at Lowe's cut all of the wood down for me -- I had my exact measurements for them. 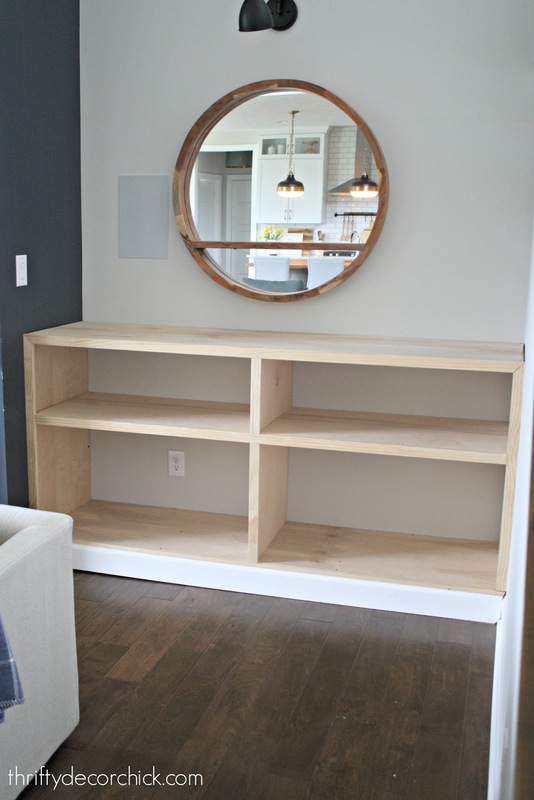 I used two 4x8 birch boards and one smaller 2x4 board for the whole project. Total cost was around $160 for all the materials (boards and trim) and I have some scrap leftover. If I had our builder do these it would have been nearly ten times that much. 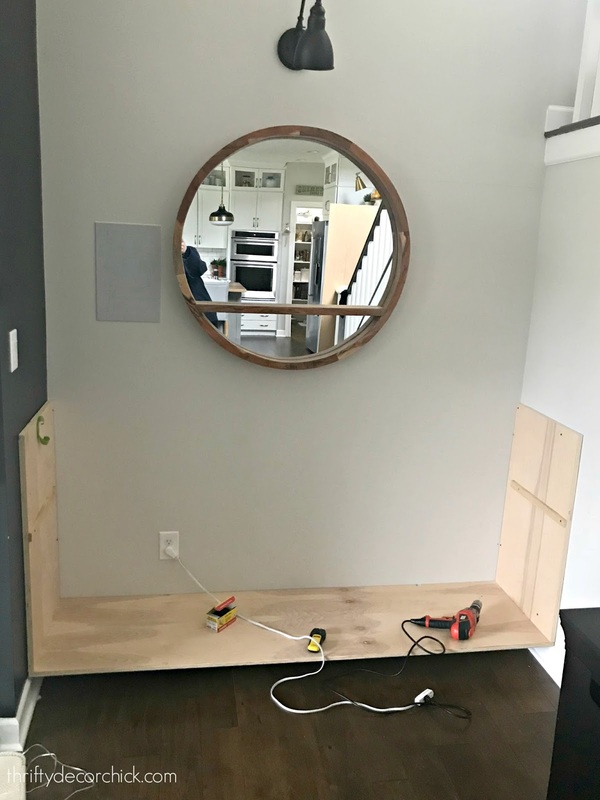 You'll need a stud finder to make sure you attach to studs and I recommend a corded screwdriver -- the more power the better. This took me about three hours to complete, but I've done this a few times. ;) Overall you'll probably spend more time caulking and painting than building! I'm off to get the materials for the other side! Now that I finished this one up I'm super excited to get them both done. The other side has a couple additional cut outs but shouldn't be too bad. 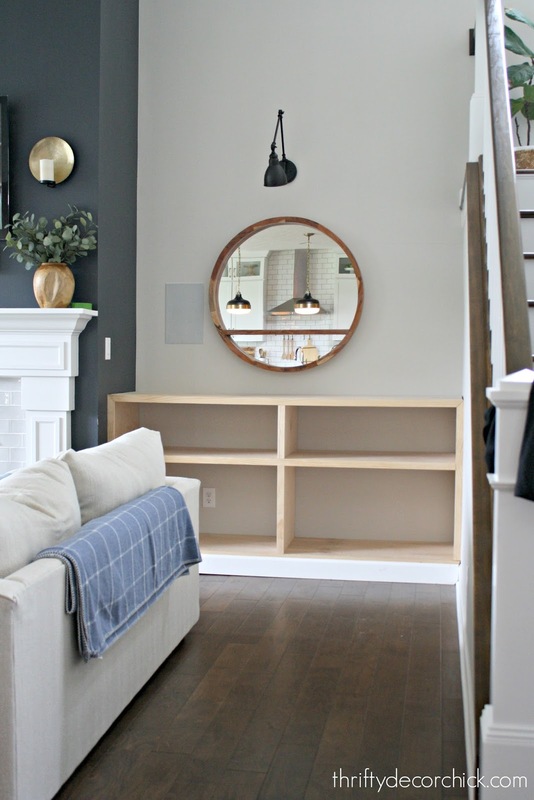 We're considering three options -- paint them the same color of the fireplace walls (that we LOVE). Paint them white to tie in the fireplace surround, or paint them white and paint the back wall the dark color to tie in the fireplace walls. I'm leaning towards painting them the dark color, but you can never go wrong with white! I may prime them and see what we think before deciding. That will give us an idea of how they'll look. 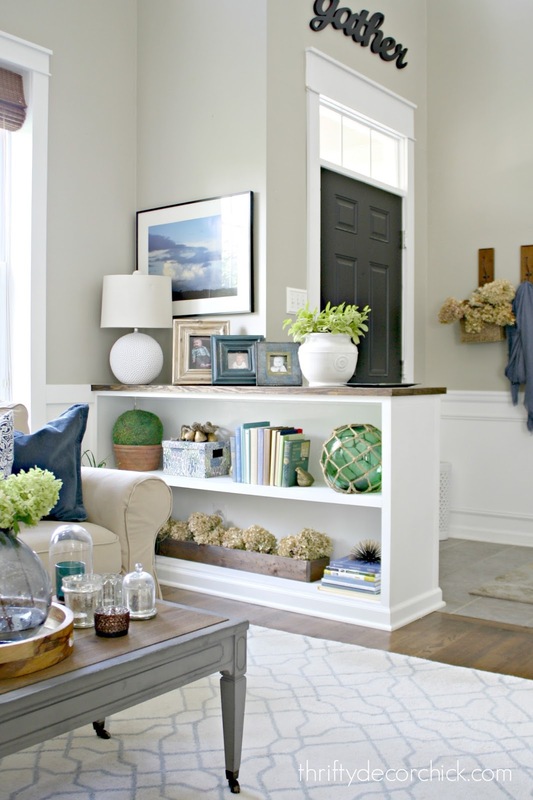 Do you have a link to your fireplace/mantel area? The sneak peek has me intrigued! Love following your progress. Love your progress and choices! Yep I link to it towards the end of the post. Thank you!! Looks great. My preference would be white all the way. Just with the lighter wood you can see how much brighter that corner is, versus the dark console. But, I know whatever you choose it will be amazing. I would be helpful if you gave more description when using the term "board." When I read board I think lumber, not plywood or MDF. I love your projects. Thank you! I stated in the post that it’s 3/4 thick 4x8 birch wood. :) It’s not MDF. Love it! One more option to add...paint them gray but lighter for contrast. Not sure what color your wall is there but thinking along the lines of Dorian gray. This looks awesome! so fun and looks simply, ha! i can see only one outlet, will you drill a hole on the board if you need an outlet on the other shelves? is it possible to put doors down the road if you want to hide the stuff?? thanks! Beautiful! So glad you went with built-ins...so much better and so professional!! GREAT job. I think white would look great! It already looks much brighter with the light wood than the darker consoles. Another job well done! ...well done! 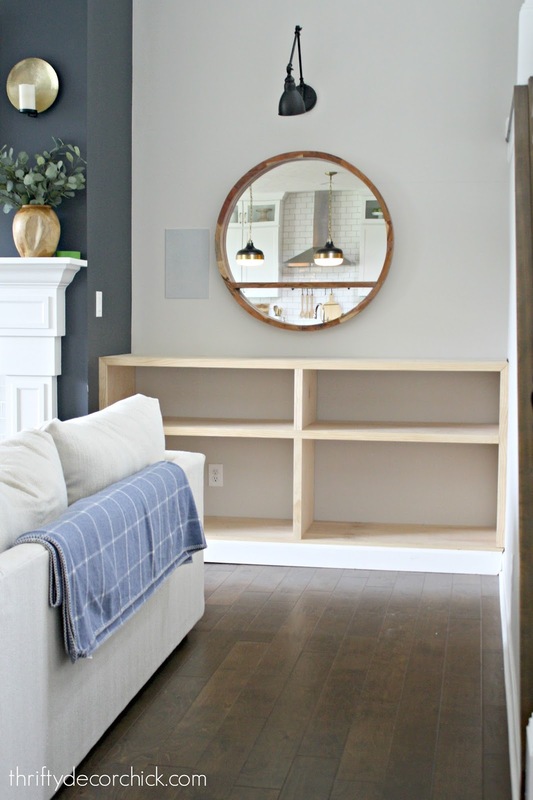 I'm liking white bookshelves with a stained top to match the wood of the mirror...kinda of like what you did with the entry bookcase at the old house! 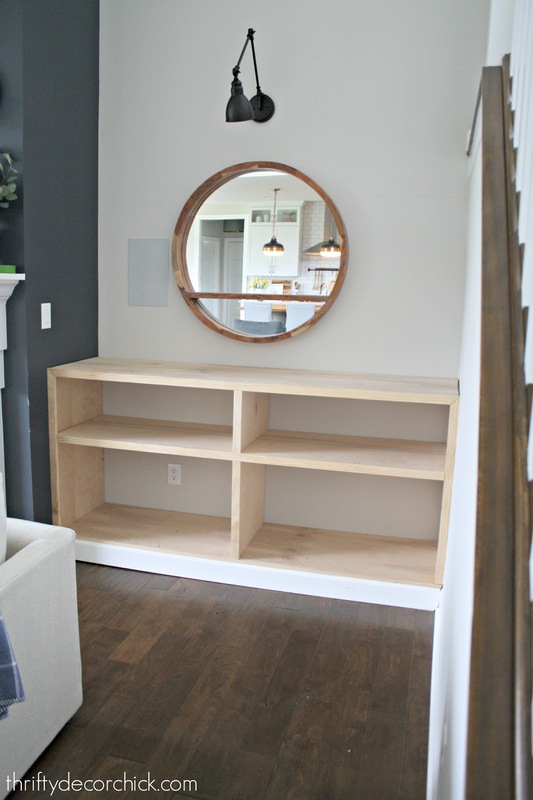 Very nice build, great work, Sarah!These bookcases really look amazing! As always...looks amazing! My vote is to paint it with the fireplace wall color... but whatever you do I will love! So glad you decided to do built ins! I think it really finishes off the room and has a more custom look. I'd probably paint it white so that the gray wall really stands out as a feature wall. LOVE IT! It is really nice. I think I may use this idea to built in my pantry. It looks so custom. Thank you for sharing. Love the built in look. 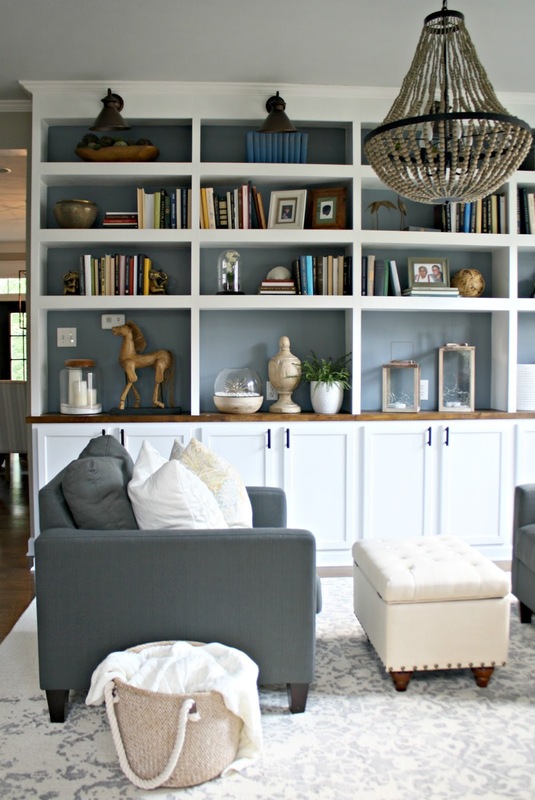 I love the color of the fireplace wall too, I'd try that on the bookcase. Another vote for white so your fireplace accent wall stands out. Looks great and yes, much simpler than the consoles that never did look quite right. I'm torn about what color I would paint also, but since I can't really see how the light is in your room, I'm not going to offer an opinion. I'm sure whatever you do will be amazing. White without a doubt! Love your blog!! You never cease to amaze me! You make this look so easy....but I'm not sure I have your carpentry skills which is a huge shame!! That looks amazing. I agree that it will be so much more clean than the cabinets you had before. It will just be seamless without any interruption for the eye to get stuck on. I'm inclined towards white paint to go with the trim. Though, in your old house you had the charcoal fireplace and the cabinets in the same color, and it looked great. I think because the cabinets were taller, it made sense for them to read as one unit with the fireplace. Not sure it would work as well with the lower shelves you've built for this house. But whatever you do, I'm sure I will love it! Was not at all shocked by this development! Those little furniture pieces were never going to fly for you long term! You could do it like you did your library wall. Or just do all in white for a nice crisp look. Your accessories will stand out. You always do a nice job with that!! Oooh I would do white like fireplace and then the dark walls. I think it will make it appear as one ha-uge wall unit! Its beautiful. I dont know if I have enough confidence to build like you. But I DO enjoy watching what you do!! Your shelves look great...even before paint. Thank you for the inspiration! Can’t wait to see what color you paint them and how you style them. I know they’ll be beautiful! 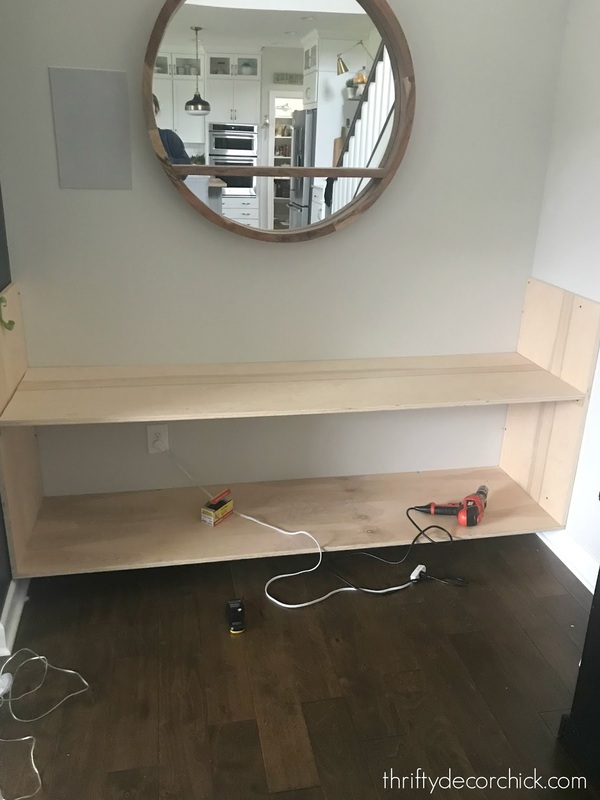 I almost have my DH convinced to build these shelves to flank our fireplace. The space beside the fireplace on each side is 56 inches. Do you think this is too wide? 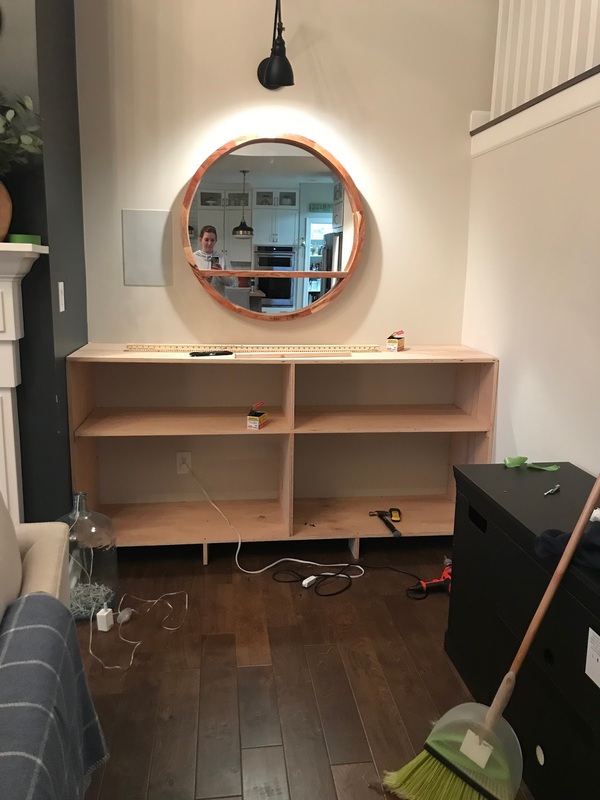 Will the support piece be enough to support the shelves so they don’t sag? Any advice you could offer will be much appreciated.